The first rule to saving money on anything is to know how much you are spending in the first place. I used to keep all the household goods under the grocery umbrella in our budget. It sort of worked in that we just added whatever we needed each week onto the grocery list and went from there. But in my mind, the grocery money was mostly allocated to food, so it would surprise me when we would always go over budget, not realizing that it was due to the trash bags, paper towels, and cleaning supplies I purchased that week. I really had no idea how much we were spending on the non-food items. Then we made a separate budgeting category for the household goods, but still purchased them along with groceries whenever we needed them. In order to keep my numbers straight, I had to go through and separate the items on the receipt to enter into our budget (we use YNAB). Talk about annoying! Have you ever tried to read some of the items on a receipt? What is LC CT CHS and why did I buy three of them? What did I buy three of that could possibly be LC CT CHS? Yeah. Totally annoying, time consuming, and definitely not conducive to understanding how much I was spending on household goods. I finally started doing an entirely different shopping trip at the beginning of each month just for household goods. This made it much easier to track my spending in this category, but I was still having to run to the store during the month to pick up shampoo or toothpaste or something else we had run out of that I had forgotten to buy in the initial trip. Worse, I was often having to add them into the normal grocery shopping anyway and having to decipher and split receipts again. So, I finally sat down and created a checklist with every possible household item I might purchase (and some blank lines because we all know I couldn't have actually come up with every possible household item!). At the end of each month, I take a quick inventory of the items on the checklist and create my list for my household shopping trip. 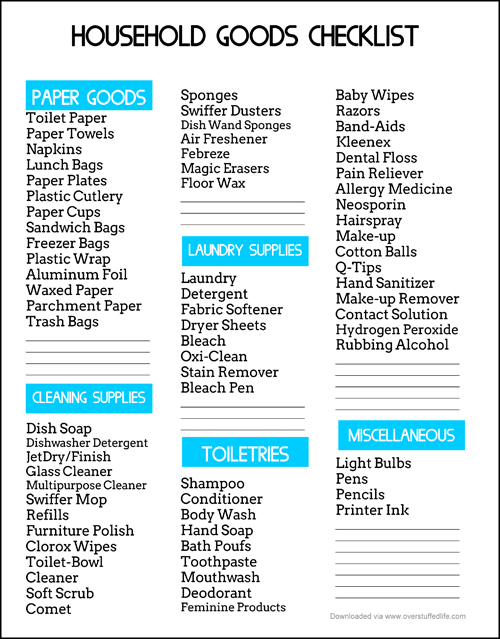 Most of these types of items only have to be purchased once every few months and so the checklist makes it so much easier to remember what I need and what I still have on hand. To download the checklist, simply enter your email into the form below. If you are on a mobile device, click here to see the form. 1. I do not accidentally overbuy items. I'm still working through all the laundry detergent I bought when I wasn't really paying attention! 2. I do not forget items. This always results in having to run out in the middle of the month to buy garbage bags where I will inevitably also buy "just a few more things." 3. I am aware of just how much we tend to spend in this category. Now I can budget accordingly, and do not go over budget every single month. I do most of my shopping for household items at our local WalMart since the closest Costco is 4 hours away (sad face). While I know coupons would save me money, I rarely coupon anymore because it is too time consuming for me. However, there are a couple other options I also use to save me money on my household purchases. I have used affiliate links for your convenience. Grove Collaborative carries all of my favorite natural/organic brands for a cheaper price than I could get them at a brick and mortar store. Brands like Method, Seventh Generation, Mrs. Meyers, and Toms of Maine. If you're interested in trying them out, my readers can get $10.00 off their first order by clicking here: $10.00 off Grove Collaborative order. For your first order, choose the products you want, and then you are automatically signed up for monthly boxes. You can change the products you receive each month, or keep them the same. Totally up to you. I have a few items on my Subscribe and Save—toilet paper, toothpaste, oxi-clean, and my fridge filter. I also do some of my gluten-free flours via the subscribe and save. You can choose exactly how often your products ship with subscribe and save. For example, I get a 27-count package of toilet paper, which usually lasts us a little over 2 months. So I have it shipped every two months and I don't ever worry about buying toilet paper. My refrigerator filter comes every 6 months. I have my subscribe and save down to a science! If you have 5 items coming in one month, you will get a 15% discount on your entire subscribe and save order. Still, the prices are somewhat discounted just doing it subscribe and save, so I don't always worry if I don't happen to have 5 items in a month, because it's not worth it to try to add a couple more items that I don't really need. To see what's available on Subsribe and Save, click here: Amazon Subscribe and Save products. Be aware that items get taken off and added onto the program regularly. For members of Amazon Prime, you can start filling a pantry box full of items you need (and groceries do count here, too, not just household items). When the box is filled, it will ship for a flat rate of $5.99. Since one of the big perks of Amazon Prime is free shipping, you may wonder why the $5.99 shipping rate. As it turns out, many of these household products are not Prime eligible because of their weight—it would be cost prohibitive for Amazon to ship them for free. So you are getting a pretty good deal by doing Prime Pantry as far as shipping costs go, and most of the items in the Prime Pantry selection are cheaper than they would be if you bought them on Amazon without using the Prime Pantry option. Not a Prime member? Try it out free for 30 days by clicking here: Amazon Prime Trial. See all products eligible for this service by clicking here: Prime Pantry. For the month of April 2016 you can get free Prime Pantry shipping by purchasing five selected items and entering the code PANTRYAPR. It looks like most of the items are pretty normal purchases and I see both Method and Mrs. Meyers on the docket. I may be trying this out myself next month. I have a good friend who has used Boxed and really likes it. As far as I can tell, it works very similarly to Grove Collaborative but has a larger range of items. They do also carry the organic/natural brands. The prices are almost always cheaper than WalMart, so it is worth it to try out. 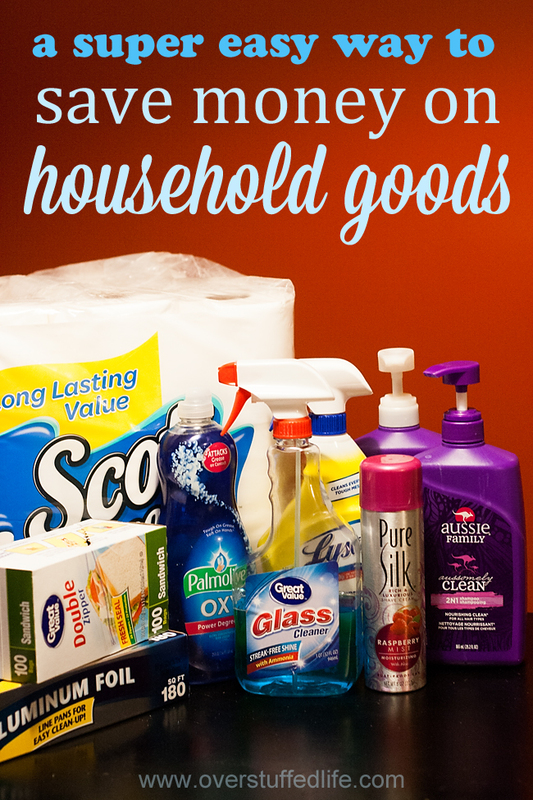 How do you save money on household goods?